I began this post on Friday night in Hamburg Germany, near the end of ICME, the quadrennial international math-education conference that’s been both exhilarating and exhausting. I’m now finishing it on the airplane headed back home. As interesting as many of the presentations have been, they’ve also been almost entirely lecture format with Q&A at the end—a format that’s likely not the format that most conference attendees would use with their own students, and assuredly not the format they want K-12 teachers in their own countries to use. I understand the reasons: large lecture-hall presentations with very large audiences, and with many of the presentations being reports on research. But I wanted my presentation to the conference’s Geometry Topic Study Group to reflect the enactivist goal of the activities I was presenting: I wanted group members to enact functions by creating them, manipulating them, and investigating their behavior. For my presentation I used the web page for my paper, available here. Next my “assistant” passed the mouse to the next group member, who used the Mirror tool and the Reflect tool to construct the reflected image of point x, and then dragged x (the independent variable) to compare its motion with that of the reflected image (the dependent variable), while I provided commentary and asked questions of the whole group. The second group member then passed the mouse again, to another group member who navigated to the section of the paper on Enacting Domain and Range, clicked Figure 5 to show its websketch, and began the construction described there. As we continued passing the mouse, we engaged in more construction, we varied independent variables, we described what we observed, we commented on what we had done, and we used geometric functions (reflections, rotations, dilations, and translations) to discover some lovely connections between geometry and algebra. By the time we finished, every member of the group had been actively involved in constructing and manipulating the websketches, and we had a chance to think and speculate about how students could use such activities to help build their own robust understandings of concepts like independent and dependent variables, domain and range, restricted domain, relative rate of change, composition, and Cartesian graphs. I was very pleased with how well Web Sketchpad (WSP) supported my presentation. We didn’t have time to go through every construction described in the paper, so it was great that the websketches were hidden until we tapped on the corresponding static figure. I also set up the webpage so that each websketch was created only when needed, which meant the page loaded more quickly. 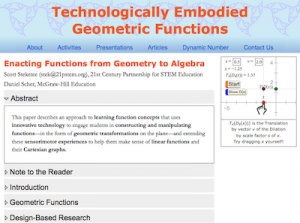 I imagine that features like this will be helpful, not just for papers like the one I presented at ICME, but also for creating web-based dynamic math lessons for students.